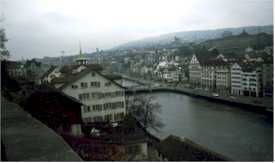 ABOVE: If you encounter a gloomy day like this in Z�rich, head for a warm and cozy beer hall. In Z�rich, the leading beer halls have a different image than their counterparts in Munich. The emphasis is more on dining than on drinking, with patrons more likely to suffer heartburn than hangovers. Bierhalle Kropf: The most refined of the three, with the best food. Zeughauskeller: Cavernous and decorated with military weapons and occasionally harried service. Rheinfelder Bierhaus: Cheerful, unpretentious, and cheap by Swiss standards.